Exotic Weapons – Players love weapons, especially magic weapons, but rarely do they deserve something magical, and certainly they don't get to buy magic weapons in town. Here's a table to help make them feel special without giving them an edge, well some are rust proof. Wasp Gun – A strange pod of ropey gray stuff in a wooden cradle with some sort of voltic battery and a pistol grip attached to it. The pod is a hive of hibernating boil wasps, large predatory jungle wasp whose sting is painful and dangerous. Pulling the trigger discharges a shock through the hive and wakes a wasp from torpor. The enraged wasp then bursts from its hibernation cell and heads in a mostly straight line stinging the first thing it finds. The weapon cannot be fired rapidly as the battery must cool between discharges. Glass Blade – A short jagged shard of razor sharp ancient synthetic glass-like substance mounted on a steel guard and carved plastic handle. It's a strange green color and mostly transparent. The blade is extremely strong for glass, about as strong as steel. Fist of the Mechanical King - A large steel hand, articulated for movement but now welded into a fist. The fist is chased with gold circuitry worked onto a steel rod and covered in fading, flashing and blinking lights in several colors. Juju spear – Covered in feathers and beaded fetishes including a real shrunken goblin paw dangling from it's cold hammered bronze head. It's even a bit magical, in so far that if one holds it while conceiving a child there's a better than normal chance that the child will be a strong and a good hunter. 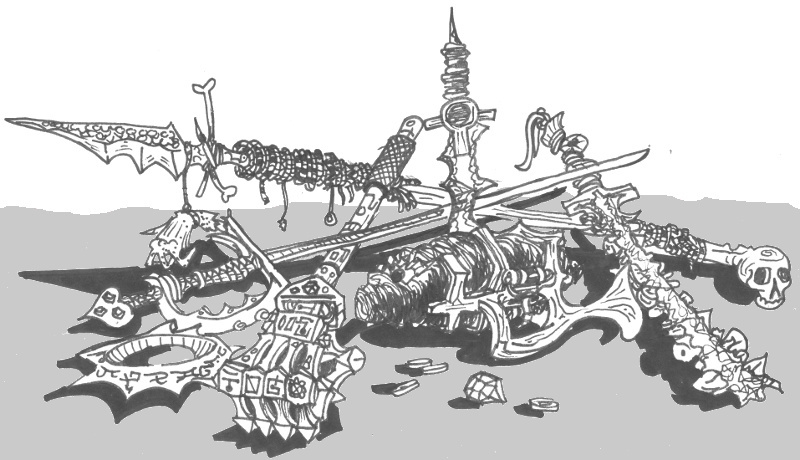 Druag's Spine – This horrible necromantic artifact the reanimated spine of some kind of horrible beast with the skull still attached. The entire glistening mass is suffused with hexed strength and when swung the fanged jaw of the skull attempts to bite foes with it's iron hard teeth. Very very 'metal' but even magic biting bone is little more effective than a spiked steel ball. Bravo's Rapier – A sleek killing tool, made of the most beautiful materials. The blade is damasked and a heated oil treatment has given the steel a red sheen. Small jewels are worked into the hilt and scabbard. It's a fine sword, excellently balanced, strong and flexible, but despite the silver wire and eel skin it's still a normal sword. Bearded Axe – A perfectly balanced one handed axe with a long blade. It's larger than a handaxe and lighter than a massive battleaxe. The bearded axe will strike like a longsword, but looks like an axe. Dental Falx – A strange living weapon, possibly of extra terrestrial origin. This 7' curved blade has an long ergonomic handle similar to bone and a cutting surface made of various large teeth set into a living gum. The weapon appears to subsist on the blood of those it strikes, and regrows lost teeth rapidly. Runic Chakra – made of a strange blueish alloy and lighter than they have a right to be these bladed rings may be used as a close range hand weapon or thrown with some practice. The strange ancient runes carved in them (which sparkle under moonlight) empower them to strike lesser ethereal creatures and the undead. Thunder Stick – The closest thing a dwarf gets to a magic wand. This heavy contraption of bronze, gold and meteoric iron is 2' long. One end terminates in a bell shape with a fist sized cavity, while the other contains an elaborate locking hatch and a gemstone trigger button. When mystic regents are packed into the rune inscribed barrel in a specially manufactured waxed scroll through the hatch the weapon will release a blast of thunderous noise and a hail of lead pellets from the bell end. Cool table. Are the illustrations all yours too? Thanks Simon, I've seen your blog before and was rather impressed. The drawings that aren't attributed are mine.